There are many reasons why criminals want to break into your house, drug habits, unemployment or simply because they have no respect for the law and think that they have the right to take what they want rather than actually paying for it. Professionally designed and fitted Security Grilles will prevent access to your home and keep you, your family and possessions safe. The fact of the matter is that if criminals want to break in and can, they will – if they want to get in and find they physically can`t they won`t, it`s as simple as that. As you can see from the image above the Security Grille, although damaged, completely prevented the burglars from gaining entry into the property and were very quickly replaced pending the insurance company payment. 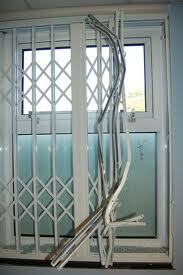 If you are considering installing high quality Security Grilles contact Alexandra Locksmith today.